Ever dreamt about what your perfect cafe would feel and look like? I saw this on awhile back on Twig&Thistle, (Kathleen finds the best packaging inspirations!) 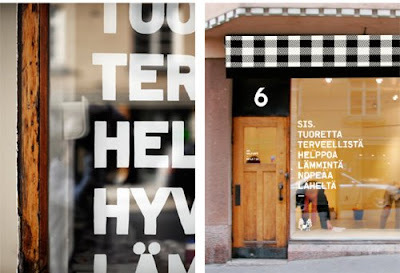 and all this makes me totally jealous of the Scandinavians and how they're always one step ahead with their coolness. I love everything about this adorable place, SIS. 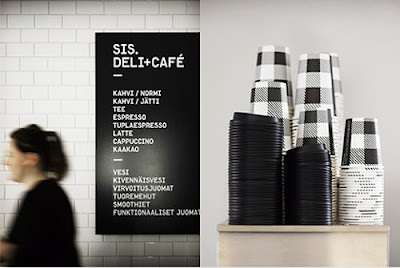 Deli+Cafe in Finland. 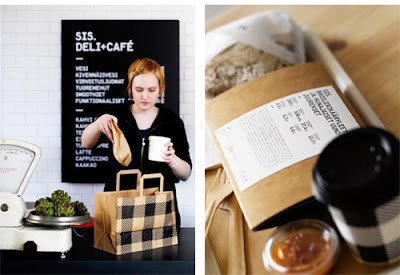 Not only do they have a well designed cafe that specializes in ecological and organic products, but their branding and packaging is totally perfect. I've always wanted to visit Finland and the surrounding Scandinavian countries. They seem to have such a great sense of warmth and thoughtfulness with their flawless integration of design in their everyday lives. Just look at it....so simple, so fresh, so clean, so cute and handsome all at the same time!! 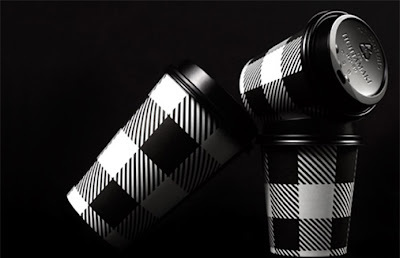 I just love the use of black & white checkered pattern through out. 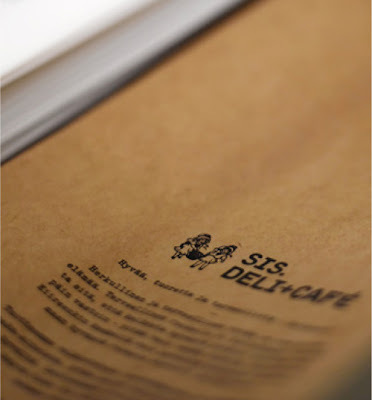 In the words of Liz Lemon: "I want to go to there"....and steal their coffee cups, bags, cookies, and even their menu. I bet even their napkins are cool....I'll take a whole pile of them. Okay, fine... I suppose I can pay 1 Euro for a heart-shaped cookie.